Schools of fishes and a mad lot of people. 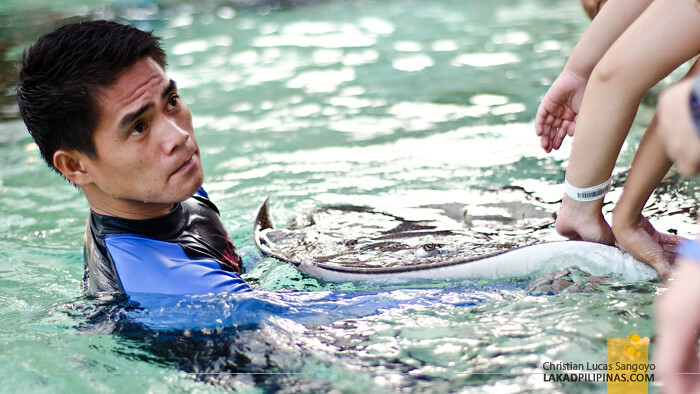 That about sums up my entire six-hour tour along the only oceanarium in the Philippines, the Manila Ocean Park. I’ve been forever hankering to explore the watery halls of this place ever since it opened last 2008, and it’s only now—seven full years later—that I was able to go. As they say, those places nearest to you are often the ones you forego the most. It was a Saturday and we were staying at Hotel H2O, the water-themed hotel set right inside the complex along Manila Bay. Even with the weekend crowd in full force, we were unable to resist the urge to use the complimentary tickets given to us by the hotel right away. So right after checking out the next day, we immediately mixed in with the throngs of weekenders and queued up for five of the thirteen featured attractions of the park. 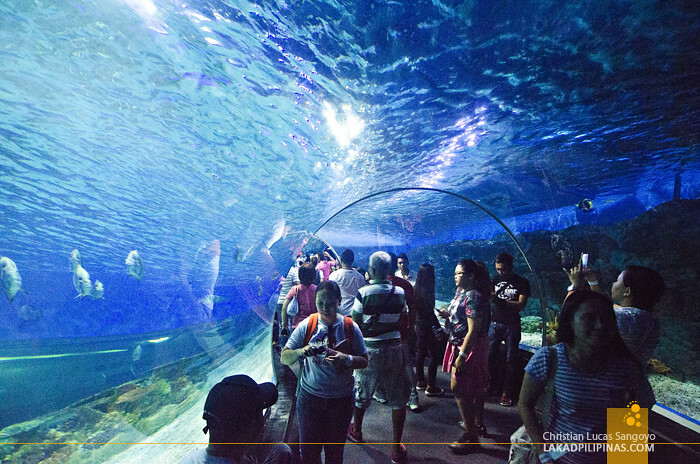 For the uninitiated, the Manila Ocean Park is subdivided into several sections, each with its own corresponding entrance fees and viewing time. 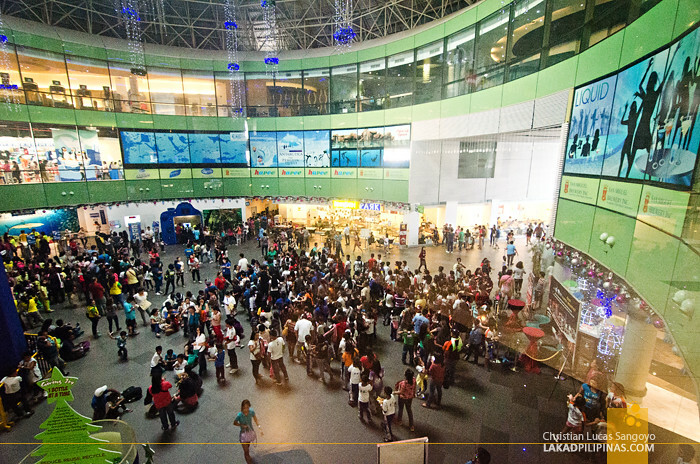 This is actually quite convenient for visitors since they can choose areas that interest them and leave off the others. 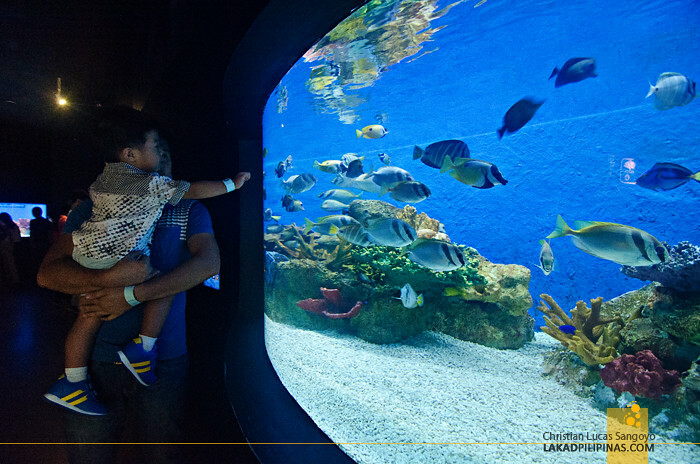 For those wanting to check out more than one area, the park offers bundled promos that combines several exhibition areas on a single discounted ticket [CHECK MANILA OCEAN PARK PROMOS HERE]. 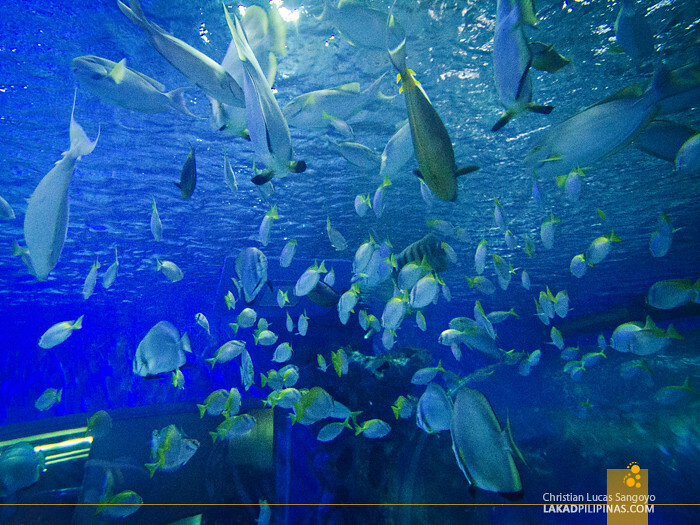 For our tour, we chose the Oceanarium—which is a must-see if ever you visit the place—the Jellies Exhibit, Sharks and Rays Encounter, Sea Lion Show and the Symphony Evening Show. 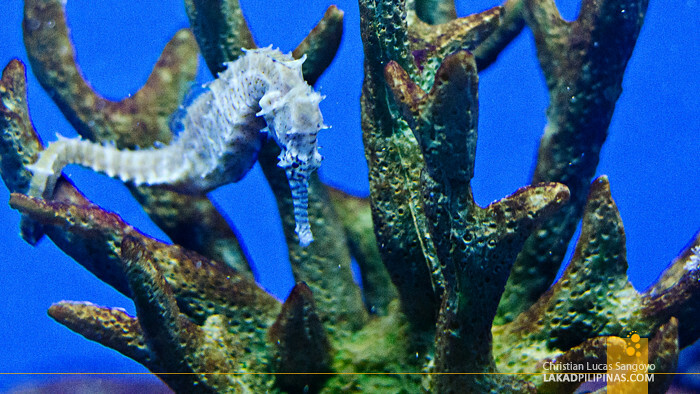 Other notable attractions we were unable to try since they weren’t included on the package we got were the Trails to Antartica, the Glass Bottom Boat Ride and the Aquanaut Experience—where you get to go down on the oceanarium with scuba gear and bubble helmets (really, really cool). 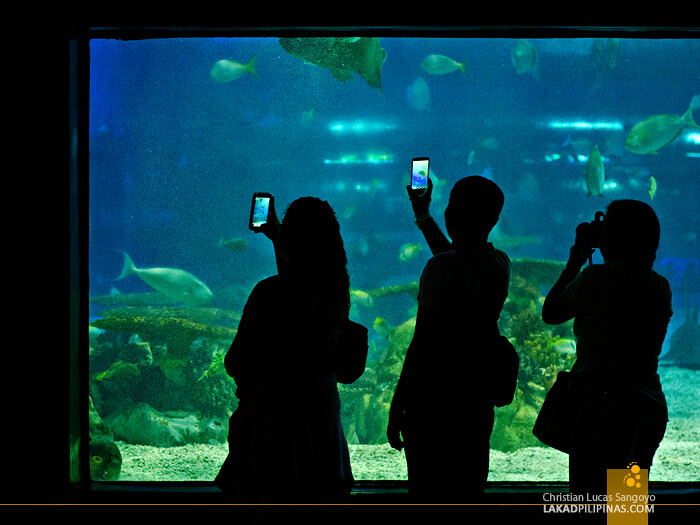 The Oceanarium is undoubtedly the soul of the Manila Ocean Park. 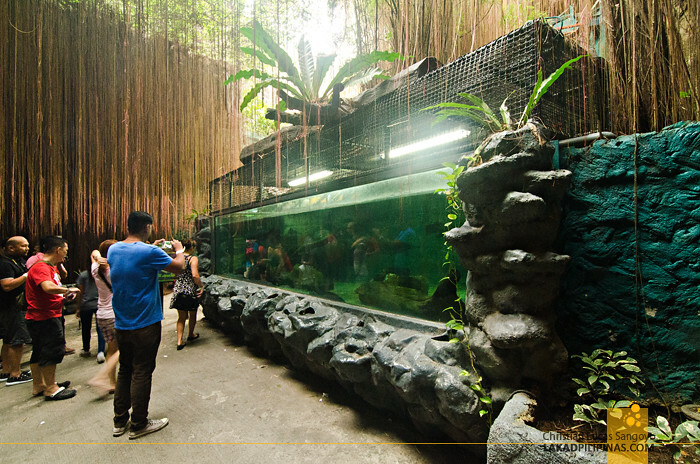 It is subdivided into seven sections, from a rainforest-like open area holding eight huge tanks filled with gigantic freshwater fishes dubbed as Agos, to the Bahura, which is housed on a dark room filled with pockets of aquariums set up with saltwater corals, colorful fishes and other sea creatures. 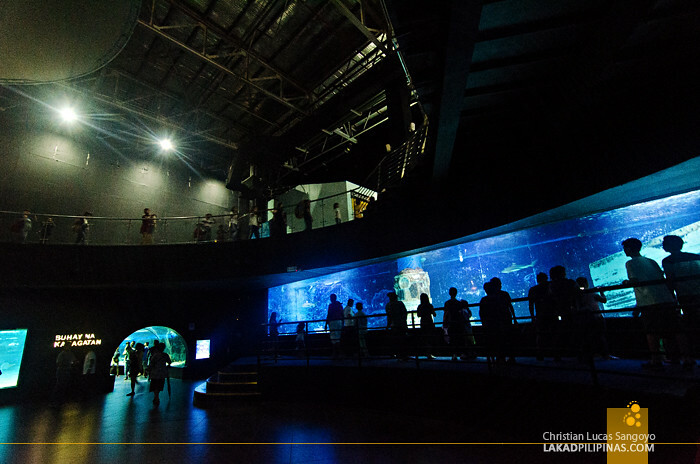 It then leads visitors to Laot, a circular hall with walls set with gargantuan fishes and stingrays swimming on equally gigantic tanks. And I’m not exaggerating when I say this, these fishes are unbelievably and overwhelmingly ginormous! 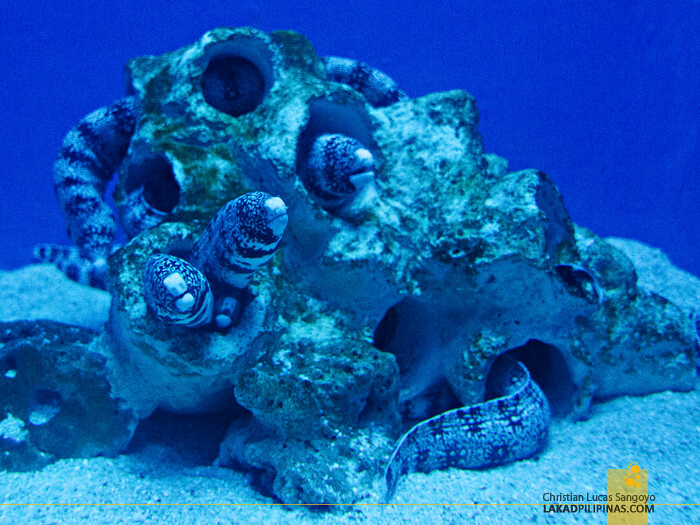 The Buhay ng Karagatan, as it is dubbed, is probably the most photographed area inside the Manila Ocean Park. The curved 220-degree clear acrylic tunnel is so popular with visitors that you can hardly get a photo without people on them. Forget about taking a selfie on this one. With unimaginable cubic meters of seawater (which is sourced from Manila Bay, by the way) surrounding you and fishes, rays and sharks seemingly flying overhead, it is still quite a sight. I just wished that they remove the sitting platforms right along the 25-meter tunnel to avoid people clustering in the area. Right after having our fill of the tunnel, we exited to the Kalaliman, Pagi and Pating areas, which were a good enough encore to the tunnel climax. 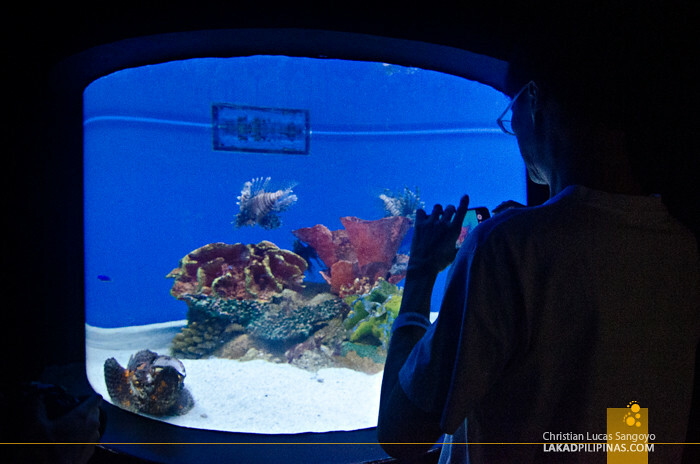 The next attraction on our list was the Jellies Exhibit. Getting there from the Oceanarium was quite a challenge though as we had to squeeze through the narrow hallways of the complex which were filled with shops selling souvenirs and what-nots. Removing these shops, which really doesn’t fit in with the theme of the park and doesn’t add up to the Ocean Park experience would really help with the flow of the place. It was quite an unpleasant experience, to say the least. 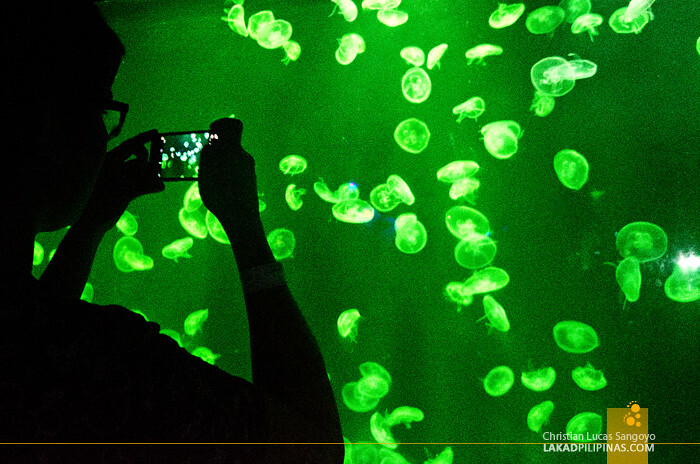 The Jellies Exhibit, fortunately, cooled our heads off after swimming through the crowd of Manila Ocean Park. 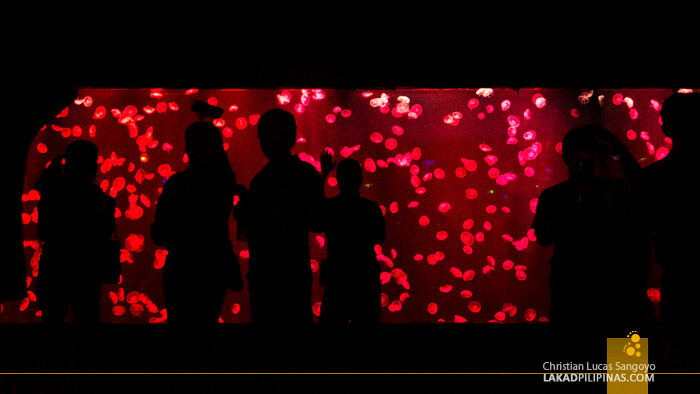 Set on a spacious darkened room with aquarium walls floating with translucent jellyfishes, it was mesmerizingly good. 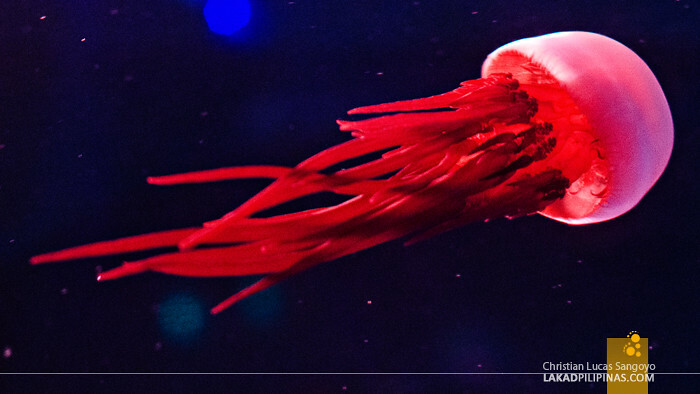 We watched, transfixed, as these creatures feared on beaches around the globe danced and changed colors along with the aquarium lights. They are a fascinating lot; alien-like, weird and magical, all at the same time. 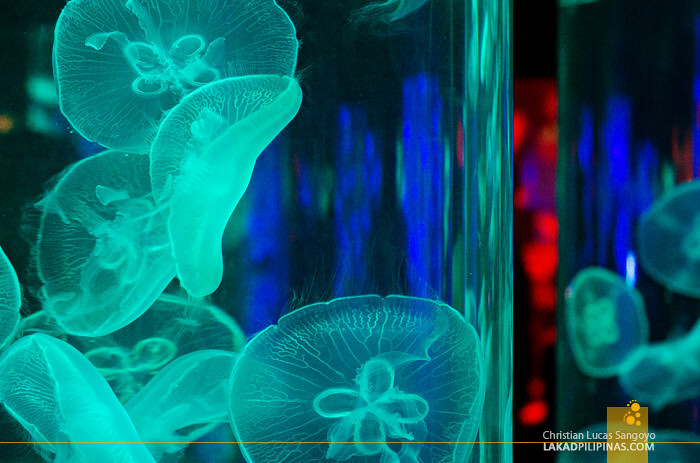 The last chamber of the Jellies Exhibit features illuminated glass tubes about a meter in diameter filled with a different species of jellyfishes from the previous. The room is actually not that large, but the installation of glasses along the walls created the illusion of an endless tubes of jellies. 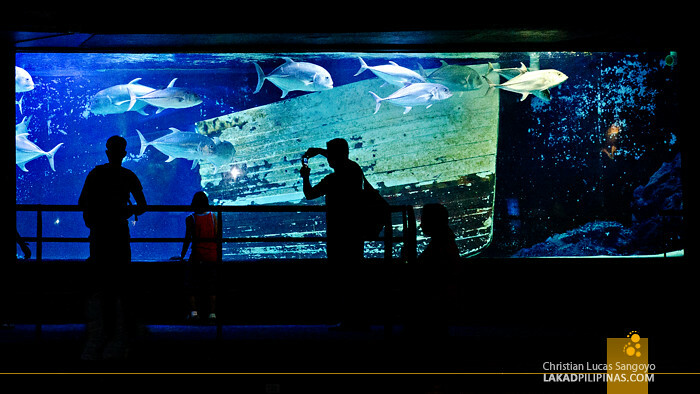 Located on the Acquatica area, the Sharks and Rays Encounter is set on meter-high pool filled with friendly sharks and stingrays. 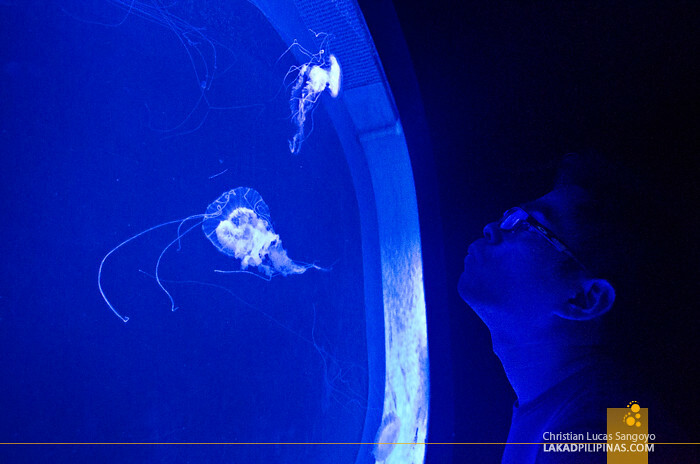 One can either experience interacting with these creatures via the park’s dry encounter where you only get to touch these animals from above or through their Aquanaut full body encounter. I’m not too sure if the practice of touching the rays by visitors non-stop is any good, I mean, if that ray was me, I’d probably give dagger looks (and probably an elbow too) to a complete stranger who suddenly strokes me (excluding pretty ladies, of course, lol). 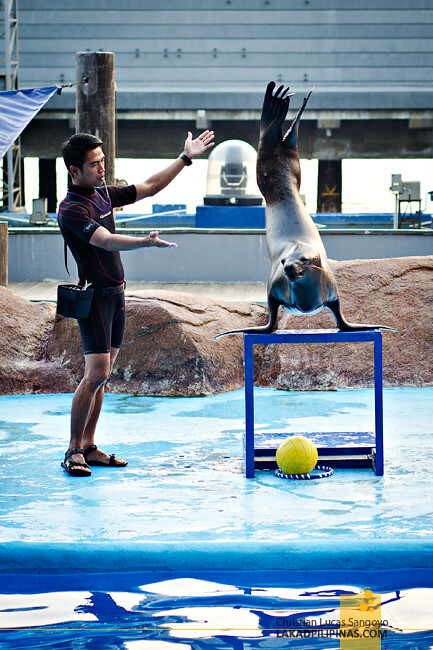 One of the most anticipated attractions at the Manila Ocean Park is the Sea Lion Show. These slick creatures came all the way from South America and draws crowds of people, be it young or old. I’m not particularly keen on these kinds of animal shows but since it is included on our tickets and I haven’t really seen anything like it, I gave in. The show runs for about half and hour and is pretty entertaining. I’m just not sure if PETA would give their thumbs up on this one. And to cap our Manila Ocean Park experience, we again sat at the Acquatica area to watch the Symphony Evening Show. I saw a lot of kids anticipating this one as it features the tallest fountain in the country, reaching up to 120 feet in height. 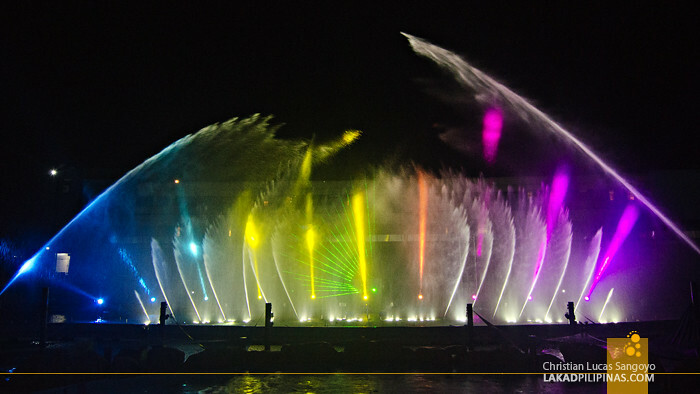 I was also expecting something grand, having previously been wowed by a similar musical fountain show in Vigan. Unfortunately this one somehow fell short of my expectations. The kids in the crowd, however, were all clamoring for more. 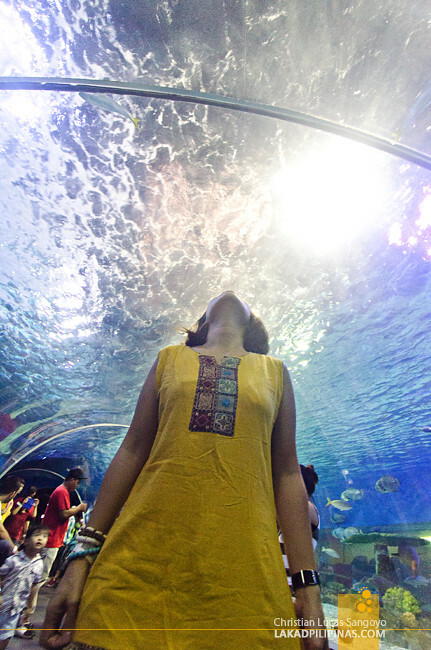 All in all, even with the hordes of people and the narrow hallways, I had a pretty good time at Manila Ocean Park. 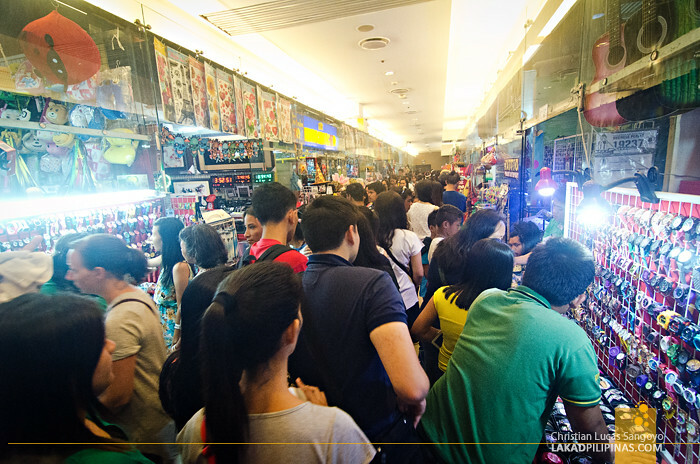 But if I were to visit again, I’d probably go very early during weekdays to avoid the thick crowd. I’m betting it would be a hundred-fold more enjoyable than what we had to go through. But heck, it was still worth the trouble, even on weekends. 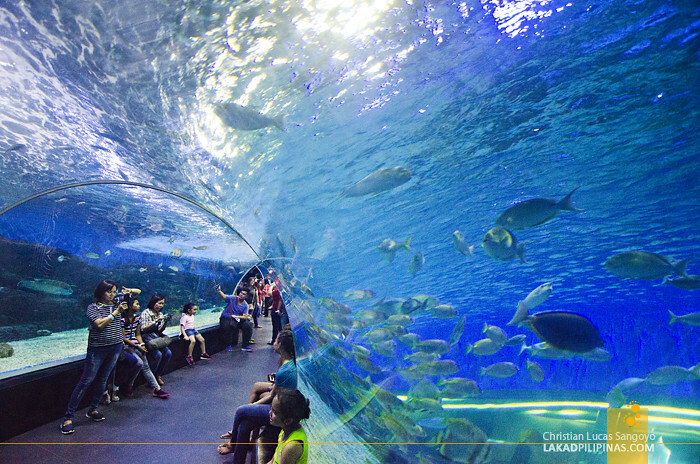 There is another Ocean Park in Subic.